How did we manage a major transit station construction project while the heart of the city continued beating around us? 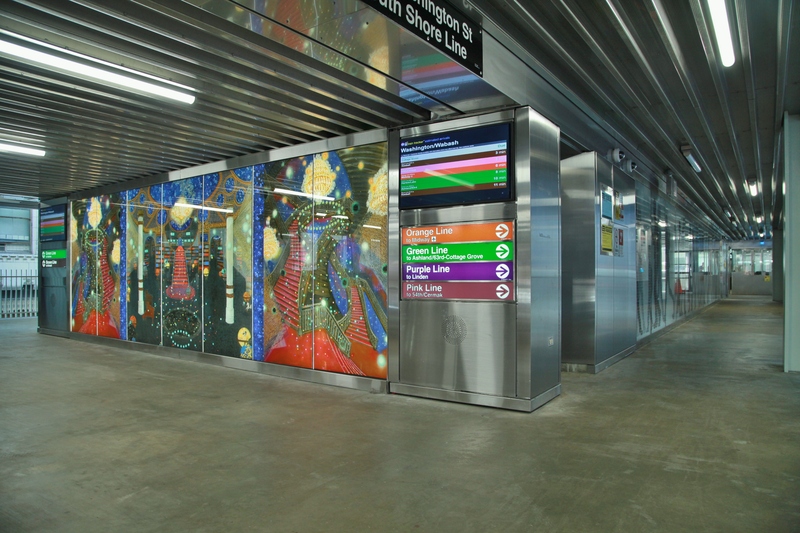 We’ve built many CTA Transit Stations over the years, but constructing the first new station in Chicago’s Loop in 20 years presented a new set of challenges. 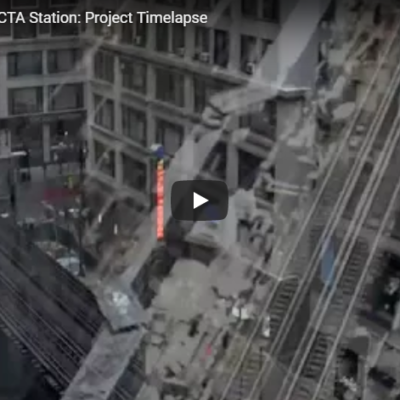 Constructing the Washington Wabash CTA Station, which replaced two existing stations that were over 100 years old, involved a great deal of exacting planning from start to finish. 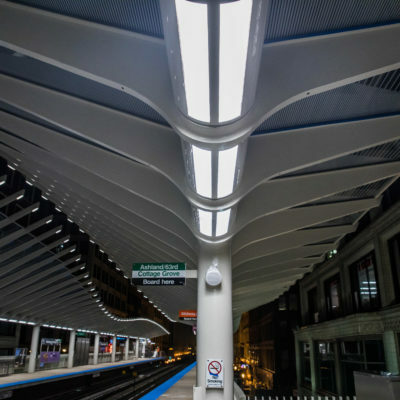 Our ability to coordinate work down to the smallest detail allowed us to plan construction of a beautiful new CTA station on the Loop Elevated structure in the heart of downtown Chicago, planning around foot and automobile traffic, the businesses in the area, and working around operating transit lines. 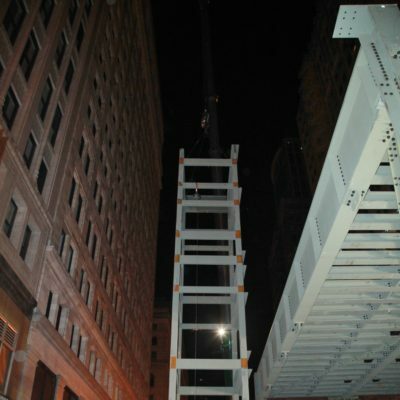 The station was originally planned to be built on the tracks above while the road below was closed, both for staging materials and for the safety of those beneath the construction. However, CDOT requested that the street open early, which changed the timeline for the rest of the project. The sequencing for the entire job had to be completely reworked. Our innovative solution to work around an open roadway cutting through the center of the worksite was to erect the majority of structure from the North and South ends. This required extensive engineering and ground penetrating radar scanning of Washington Street and Madison Street, to be sure no subsurface voids existed. 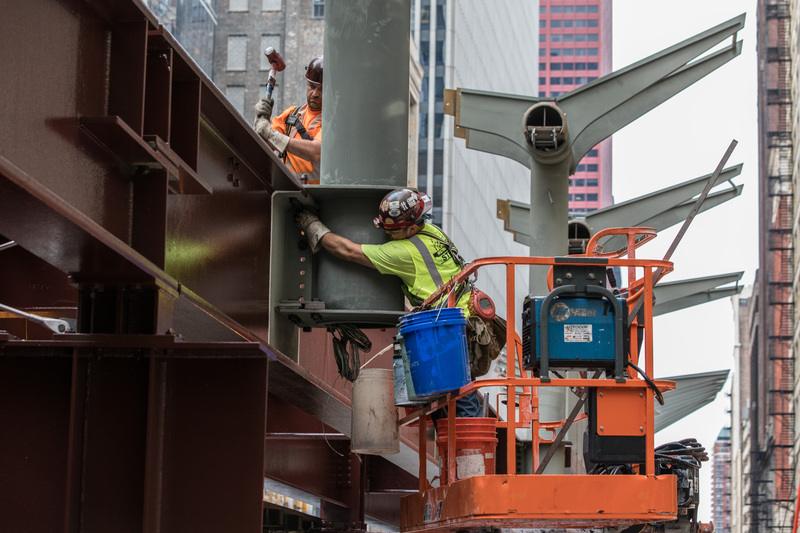 In addition, work that was originally planned to occur daily over multiple months was condensed into 50-hour continuous weekend closures of the CTA track and Loop traffic intersections. 500-ton cranes were utilized to achieve the required reach distances from the North and South. This kept the roadway open while work to build the station and canopy could proceed above. 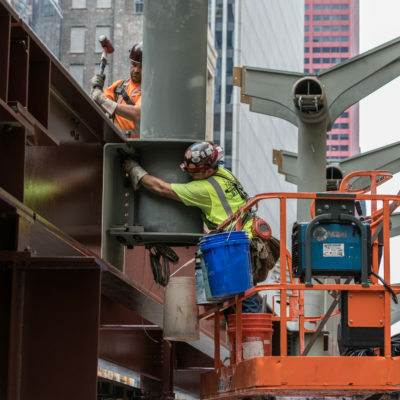 Multiple weekend shutdowns were used over the duration of the project and all had to be planned around major events, such as concerts in Millennium Park and festivals such as Taste of Chicago. Tasks completed over these weekends included demolishing 50-foot spans of old track, removing and rebuilding new tracks; rail alignments; setting precast platforms; building canopy structures; and installing glazing on the platform level canopy. 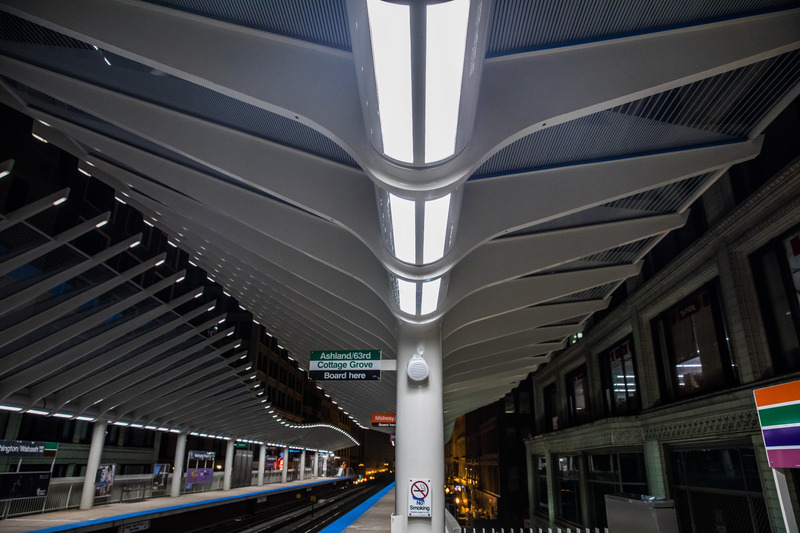 Prefabrication of structures, including the canopy spine and elevator shafts, helped minimize impacts to CTA service. 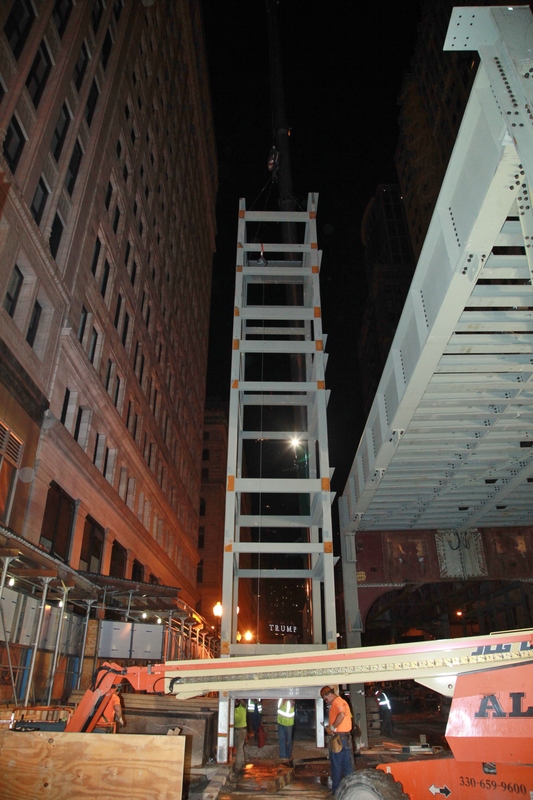 These sections were built offsite at the fabricators’ shops, transported to the jobsite, and erected onto the structure during CTA out-of-service hours between 1:40am and 4:00am. 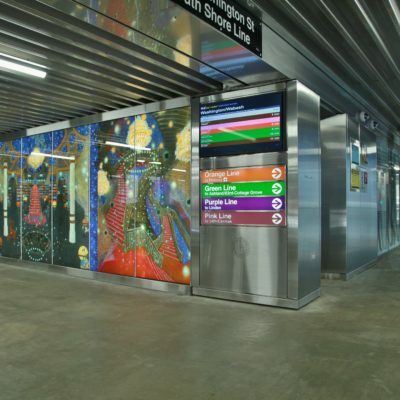 Even with all of the changes to the project scope and reworkings of the schedule, the station opened to the public on August 31, 2017.